People seeking affordable housing will have greater opportunity now that Village at River’s Edge has started work on another phase of the development in north Columbia off River Drive. The newest phase will offer 124 two- and three-bedroom units, a community building, an outdoor gazebo and a play area for children, according to a news release. The privately developed homes are in addition to 60 Columbia Housing Authority townhouses on the site. 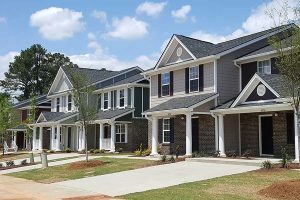 Developing the residential properties is Chamire Holdings’ partner Charles Johnson of the Carolina Panthers professional football team, along with the U.S. Department of Housing and Urban Development, Bank of America and assistance from the local Housing Authority. The delayed and troubled Village at River’s Edge complex overlooks the Broad River. Once a Housing Authority project, the complex received about $10 million in HUD funds as well as some $1.7 million in city funds. Slow to get off the ground, Village at River’s Edge is beginning to work toward its initial grand plans of a 220-unit public/private partnership.